The internationally recognized Bible teacher and daughter of Billy Graham unpacks key biblical truths wrapped in personal insights to reveal how the presence of the Holy Spirit shapes the daily life of a Jesus follower. 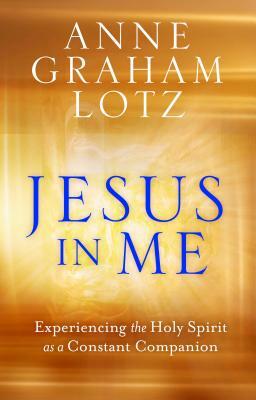 In Jesus in Me, Anne Graham Lotz draws on her rich biblical knowledge as well as her personal story--including her recent cancer diagnosis--to help us understand that the Holy Spirit is not a magic genie, a flame of fire, or a vague feeling. He is a Person who prays for us, guides us in our relationships and decisions, comforts us in pain, and stays by our side at all times. In this seminal teaching, she explores seven key aspects of the Holy Spirit that will revolutionize how you understand and relate to this vital third Person in the Trinity. As Anne writes, "One of my deepest, richest joys has been discovering by experience who the Holy Spirit is in every step of my life's journey. Each name that He has been given--Helper, Comforter, Advocate, Intercessor, Counselor, Strengthener, and Standby--reveals another aspect of His beautiful character and has provoked in me a deep love for the One who is my constant Companion...Jesus in me." Discover how to better love and rely on the person of the Holy Spirit--and embrace how much He loves you. ANNE GRAHAM LOTZ, called "the best preacher in the family" by her father Billy Graham, is an international speaker and the best-selling, award-winning author of numerous books, including Just Give Me Jesus. The New York Times named Anne one of the five most influential evangelists of her generation. She's been profiled on 60 Minutes and has appeared on programs such as Larry King Live, The Today Show, and Hannity Live. Anne is the president of AnGeL Ministries in Raleigh, North Carolina, and the former chairperson for the National Day of Prayer.